Workout got you sitting sore and don't know what to do? Learn how you can turn each water-bottle laying around in your apartment into world class massage exercise equipment. In the global effort to battle global warming, it's increasingly important that we exercise separating papers from plastics and recycle more than before. It turns out that there are people taking the exercise of recycling to a whole new level by using empty water bottles to help them diet. There are many cost associate with diet and exercise, such as the cost of buying supplements and exercise equipment. Along with using water bottles that you end up throwing away, that cost is zero. In addition, due to the fact there is an endless supply being thrown away as garbage, if you happen to break one, replacing one is as easy as picking one out of the garbage. This is what makes using water bottles so attractive and eco-friendly. There are many ways you can put your water bottles to use, such as performing deep breath exercises training your abdominal muscles, filling them with water and using them to help you weight train. The list is endless and only limited by your imagination. Who would have known that all you need to get your diet and exercise program started was a pile of garbage, water bottles. What's stopping you from doing the same? In this column, we are going to learn how to put your water bottles to work before throwing them away. It's easy to modify the weight of water bottles by changing the amount you put in them. Let's see how we can make better use of this useful property. Building a water bottle, hassle-free dumbbell! Let's kick things off by making our first dumbbell by simply filling up water bottle with water. The advantage of using water is that it is easy to make you dumbbell lighter or heavier just by changing the amount you put in. In addition, clean up after working out is as simple as emptying the water bottles, making them weightless after use. What this means is that as long as you have both empty water bottles and a place to supply your water, you can do weight training anywhere. Although with conventional dumbbell exercise there are many people who are just looking to tone down versus gain muscle mass. Don't worry; as long as you don't swing too hard, slowly and smoothly go about you movements, then you should be fine. In effect what this does is make it possible to weight train without putting on too much muscle mass. You may be thinking that dieting is alright, but what you are really looking for is a dumbbell that can help bulk up too. This next tip is for you. First start by filling your water bottle with sand. Then, proceed to filling it up with water. By doing this it is possible to drastically increase the weight and hardness of your dumbbells. For those looking to go heavy it is recommended that you use larger size bottles. In fact, just the opposite diet method exist, blowing into water bottles. In this exercise just by out your air into an empty water bottle, performing diaphragmatic breathing, is it possible to get a decent abdominal workout. Start by breathing slowly for about 10 seconds. At that point, put you mouth against the mouth of the water bottle, sucking its walls inward. Note that in the case you are able to cause the walls of the water bottle to collapse completely, it is hard to return it to its original form. So, before that happens, stop yourself and restore the water bottle to its original condition. After repeating this exercise about 10 or so times, you will notice that it is harder than you thought and can feel the effects it had on you stomach, similar to the way you feel after doing to many sit-ups. While doing this exercise you end up having to use cheek muscles, making it an effect way to tighten the skin around your face and get rid of that double chin, making it an effective face slimming diet. Above all, by repeatedly crushing and restoring you water bottle begin to break down, making them easy to throw away than in their original condition. The next thing you know, you are able to fit more and more water bottles into the reusable garbage bag and living a more eco-friendly lifestyle. Turn your crushed up water bottles into pieces of massage equipment! The more bumps the better. This surface when put against you skin has a enhanced effect that stimulates the muscles and can help you get rid of your body's waste products eliminating unwanted sagging and dreadful edema. Using them the same way you did as dumbbells, add water before using only this time make it warm. The fact that we are going to be using it as a massage device requires that water to be warmer, prevent your muscles to shrink when put up against your skin. This way not only does it help you loosen up the muscles you've been training with sand-water dumbbells; it also helps promote better blood flow making it an ideal massaging tool. When applying this technique to areas with less surface area, such as your face and arms, using a smaller size bottle is recommended. Along the areas of your back and stomach use the larger ones. Depending on which parts of your body you intend to massage finding the right size bottles is useful when actually using them for a massage. What you have just read is what on your diet menu for exercise using water bottles. As you begin to start to incorporate more water bottles into your diet and exercise routines, don't be afraid to try no things. You never know how well it works until you try it. Staying on your feet, always looking for better ways to get fit and be more eco-friendly is what makes the water bottle diet so special. Good luck. Saving the planet and getting in shape is now in you hands. Tired of the same old exercise routine? You aerobic instructor isn’t funny anymore. Dive into the amazing fitness benefits you get by exercising in water. There is a whole new world of exercise to be taken. 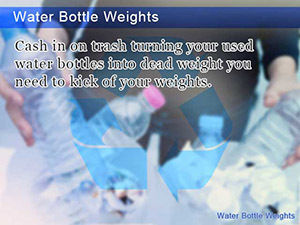 Cash in on trash turning your used water bottles into dead weight you need to kick of your weights. 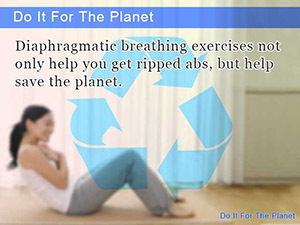 Diaphragmatic breathing exercises not only help you get ripped abs, but help save the planet. 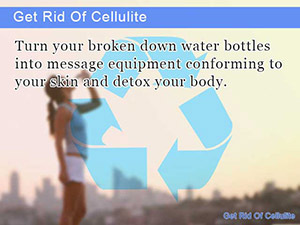 Turn your broken down water bottles into message equipment conforming to your skin and detox your body.